DataTraveler micro Duo 3C has a dual interface that works with both standard USB and USB Type-C ports. It's an ideal way to provide extra storage for the latest smartphones, tablets, PCs and Mac computers, which may have limited expansion ports, and it's easier than sharing files via online services. It's plug and play and fast, with speeds up to 100MB/s read and 15MB/s write, and it has a rotating cap to protect the reversible USB Type-C connector. 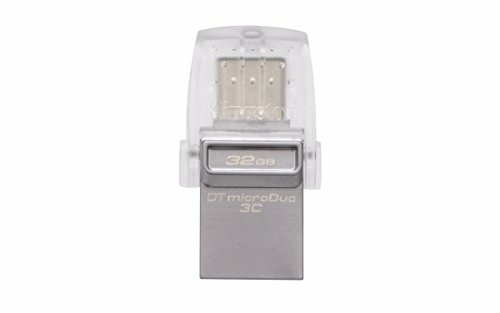 Versatile - DT micro Duo 3C works with newer USB Type-C devices such as smartphones and tablets and is also compatible with USB Type-A ports on existing USB host devices. Store more - Extra storage for the latest smartphones, tablets, PC and Mac computers with Type-C ports. Guaranteed - for your peace of mind, DataTraveler micro Duo 3C is backed by a five-year warranty, free technical support and legendary Kingston reliability.